Woburn, MA – December 4, 2018 — /BackupReview.info/ — Kaspersky Lab issued a new report today, revealing that of all the new malicious files detected by the company’s technologies in 2018, the number of files that were backdoors rose by 44 percent. The report also found that the overall volume of ransomware increased by 43 percent, and nearly one-in-three (30%) computers encountered at least one online malicious threat in 2018. These results show that malware, particularly backdoors and ransomware, remains a significant risk for consumers and businesses heading into 2019. 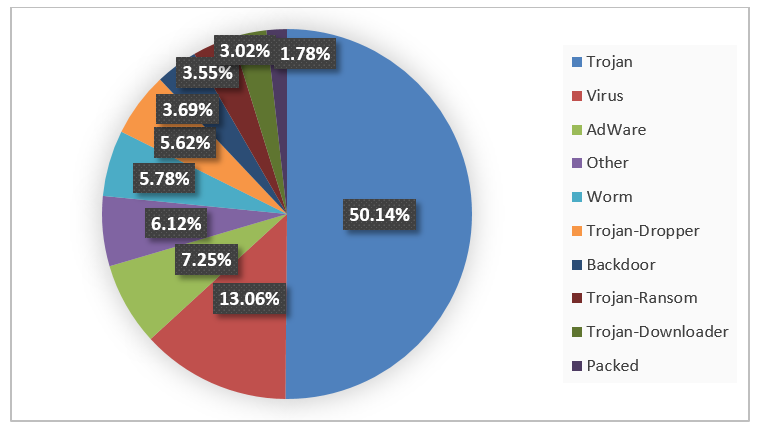 In 2018, backdoor and ransomware (Trojan-Ransom) detections comprised 3.7 percent and 3.5 percent, respectively, of all new malicious files collected by Kaspersky Lab in the first ten months of the year. Detections of backdoors rose from 2,272,341 in 2017 to 3,263,681 in 2018; while ransomware was up from 2,198,130 detections in 2017 to 3,133,513 in 2018. Overall, Kaspersky Lab’s detection technologies handled 346,000 new malicious files every day in the first ten months of the year. The number and range of new malicious files detected on a daily basis is a strong indicator of the interests of cybercriminals involved in the creation and distribution of malware. In 2011, Kaspersky Lab technologies detected 70,000 new files a day, and by 2017, the number had risen five-fold to 360,000. In 2018, Kaspersky Lab solutions repelled 1,876,998,691 attacks launched from online resources located all over the world. The company’s web antivirus solution detected 21,643,946 unique malicious objects. Do not open any suspicious files or attachments received from unknown sources. Do not click on any links received from unknown sources or in suspicious online advertisements. Create strong passwords and be sure to change them regularly. Always install updates when prompted, as some of them may contain critical security bug fixes. Ignore messages asking to disable security settings on your operating system or antivirus software. Use a robust security solution across all of your devices, such as Kaspersky Internet Security or Kaspersky Security Cloud.